The Nerdie NASCAR helmet kit has been developed through our experience endurance racing in the 24 Hours of LeMons. While Nerdie is new to the web, this product has been serving racers since the fall of 2011 with several hundred in use. These helmet kits are handmade from scratch here in the USA. 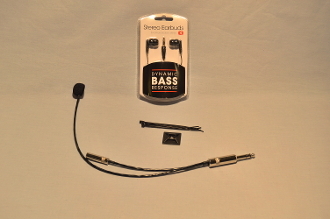 Nerdie uses high quality all metal Rean connectors with fully shielded wiring and a noise cancelling electret microphone. The end result is a effective, durable, reliable and affordable helmet kit. The Nerdie NASCAR helmet kit functions like a typical NASCAR helmet kit with two primary differences. Wired for stereo earbuds. They can be wired for mono earbuds as well but stereo is the most common. While this helmet kit is wired like a typical NASCAR style helmet kit, the microphone impedence and style does not always allow for the same universal interchangeability with a standard NASCAR helmet kit. It will work with our harnesses which are tested to support the typical 150 Ohm dymanic microphone as well as the mics we use. This helmet kit does work with other car harnesses in most cases, but not all. This helmet kit usually works fine with Motorola radios through a standard NASCAR car harness. THIS WILL NOT WORK WITH MIDLANDS USING A STANDARD NASCAR CAR HARNESS. It will require an adapter or a Nerdie car harness. Please contact us if you plan to use the Nerdie Helmet kit without a Nerdie car harness.